Happy New Comic Day! There are quite a few good books hitting shelves today. I think I'll be picking up around 10-11 of those. But you know how it goes when you walk into your shop. You get the books from your box and check the new releases for anything you may have missed. Your browsing and grab a book here and there. Before you know it, you've grabbed another 3-4 issues. Not that there's anything wrong with that. I do that quite a bit actually. But onto the business at hand. This could possibly be the worst selection of covers I've come across since I began this feature. Let's hope it picks up. Don't take that as a indictment of the quality of the releases for the week, because as stated there are some really good books coming out today. It should come as no surprise that my pick for this week is one of the biggest titles being released today. That's not even the reason why though, it just happens to be the best looking cover out today. I actually tried to put it to the side and pick another, but that wouldn't be fair. So without further delay, here is the amazing cover to Avengers vs. X-Men #1. We can thank Jim Cheung for this marvelous piece. You'll notice the energy flying off the book. There are a ton of characters on both sides. 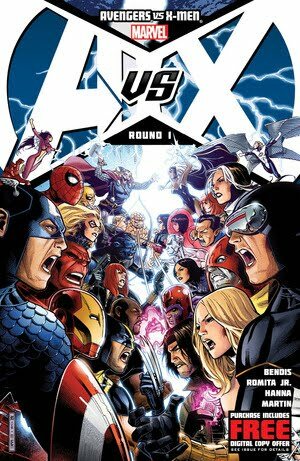 Also, Wolverine and Beast are on the Avengers' side while Storm, a recent Avengers addition, is maintaining her X-Men ties. On a sidenote: I have an X-Men tattoo but I cosplay as an Avenger. Now I'm so confused haha. No, not really. I'm an X-Man forever. Can't wait to read this. Who's jumping on board for this series? What do y'all think of Cheung's cover? Let me know. Keep it nerdy my friends.